Ten years ago, on a crisp Sunday morning, the 11th of October, at the light of dawn, the NAMES Project AIDS Memorial Quilt was unfolded on the Washington DC Mall. Two panels with St. Louis connections, were among the nearly two thousand three by six foot multi-colored cloth panels opened to the rising sun, the spirits of those they remembered, released to the air above the Quilt, to move among the pilgrims walking their pathways, until the time came for the Quilt to be folded up at day's end. A poem written by Pat and Mayer Levy, graced the cover of the program that day. Their panel for their son, Michael Jay Levy, displayed this evening in the room next door, and the panel for Richard Neil Eastman, were the first of hundreds of St. Louis panels too soon to follow. Both are pictured in the book: The Quilt, Stories from The NAMES Project. That Sunday in October was also the day of the second Lesbian and Gay March on Washington. For many of us at the march, that display of the Quilt was our first exposure to the Quilt. Patrick Leonard, my buddy, and I stopped at the Quilt on our way to the March rally. In a radio interview Patrick did with Sandra Spiritas in December 1998, three months before he died, he described his reaction to his first viewing of the Quilt, and elaborated on the energy, the meaning that kept him going as he worked, over the next months, despite the complications of AIDS, on setting up a workshop, organizing a chapter, looking for a site for a display, arranging media interviews, and doing the hundreds of other things that got the workshop, chapter, and display off the ground. Word had gotten around after the display in DC that the Quilt might be going on display in sites around the country, including St. Louis. A meeting was called for the evening of January 3, 1988, and Jack Caster came to town from the NAMES Project in San Francisco, to tell us about the plans, and encourage us to work on finding a display site, and preparing for the visit of the Quilt. Fifteen of us were there that evening at the Red Cross building, the site of St Louis Effort for AIDS, an organization that would prove to be a great friend of the chapter over the years, paying phone bills, providing volunteers, getting out information, etc. Jack took a photo of all of us there that evening. I don't know where a copy is, and don't have a complete list of all those at the meeting. I recall some of the most active people in the early days of the chapter being: Mayer and Pat Levy (who co-chaired the display committee and lined up major funding from AT&T), Trish Phifer-Harwig, Vann Johnson, Tony D'Angelo, Patrick Gregory, Tony Hatch, Tim Cusick, Joel Hershey, Tish and Bill LaRock (and their daughter Rachel), Bill's lover Glenn Warnecke, David Long, and a woman named Norvella, and Ron Walker. Patrick Leonard's lover, Dan, worked logistics for the display, Ellen Lowenstein coordinated volunteers, and Roseanne Weiss handled public relations. November 4, 2016: Ciao! was a pioneering gay male travel magazine in business for most of the 1970s. Exemplifying the open and uninhibited style of the gay liberation era, Ciao! profiled cities all over the world. In 1974, they published a piece on St. Louis. Ciao! 's article on the Gateway City offers a revealing looking at St. Louis's gay scene as it was more than forty years ago. The article features rare images of several St. Louis LGBT destinations. These include the only known surviving photograph of Club 115, a gay bar that in various guises had been open since at least the early 1950s. Read Ian Darnell's blog post about Ciao! from the Project's partnership with the St. Louis LGBTQ Mapping Project in partnership with Washington University and the Missouri History Museum. Ciao! October 30, 2016: St. Louis' Herbies' was legendary. 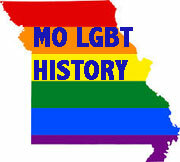 No account of St. Louis' LGBT history is completed without the wild stories of the bar, its staff, and patrons. 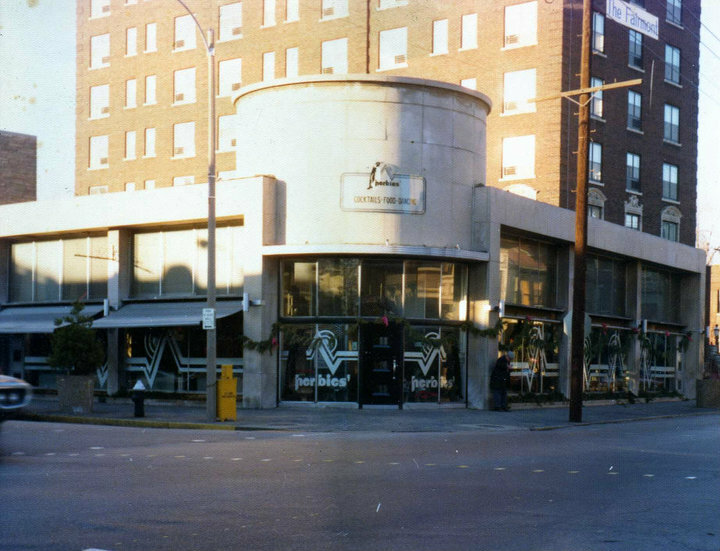 Herbies' was the epicenter of St. Louis' CWE and its early 1970s Halloween celebrations. During 2016, a group of former Herbies' staff and patrons began a Facebook group to recall remembrances of the storied bar. The following history was posted to the group along with several memories from Herbies' staff. Thanks to the entire group for sharing their recollections. Having successfully opened Balaban's in 1972. Herbie Balaban Carp (he later dropped the Carp on the death of his stepfather I.L.Carp) felt he had more to achieve. What he had set out to do was restoring the Central West End, a once tony area with shops, tea rooms, luxury housing, and tons of fading charm. With Saks, Montaldo's, Peck and Peck, and other stores leaving Maryland Plaza, the popular Woman's Exchange, a charming lunch and retail business at the corner of Maryland and Euclid, also made the exodus and this opened up a huge opportunity to the ambitious developer.The impressive Art Deco building would make a top rate restaurant with great style and panache as only Herbie could do. Along with his bar manager from Balaban's, Herb Glazier, they would open Herbies’. Employing former St. Louisan Jimmy Miller, a designer and artist, Patsy Degener, and a full gamut of additional St. Louis talent - including Sam Langley who designed and painted the iconic Art Deco penguin windows, their project grew into probably the most unique eatery in the country. The publicity was instantaneous.The menu items included New Orleans style BBQ shrimp, Steak Diane, and Bananas Foster. The wait staff wore pleated grey striped trousers, pale green shirts, and burgundy sweater vests. The hostess was the stunning African American model Carmen Davis and Ernst Trova style planters were placed along brushed chrome railings and brimmed with fresh flowers. No expenses were spared. The reception locally was mixed with people expecting a new Balaban’s. Herb Glazier installed top of the line bar equipment including a drink "gun" that gave a one ounce shot of liquor, the proper amount, but locals were used to a good full hand poured shots, and the place got a reputation as an expensive bar with weak drinks. The food while interesting, but wasn’t as drop dead over the top wonderful as Adalaide Balaban and Lady Charles had down the street at Balaban’s, and the crowds thinned. Glazier, a well intentioned man was no Herbie, and as a host had no panache. He would never buy anyone a drink, and all this fantasia seemed hopelessly wasted. Things went from bad to worse when it was found that a Herbies' waiter had hepatitis and died. The place was dying on the vine. Glazier got antsy and wanted to be bought out within the first year and a half of business. Herbie’s wife Adalaide, who didn't want the place at all initially, was thrown in as Herbie was needed full-time at the ever booming, ever expanding Balaban’s. New dining rooms could not be opened fast enough. Adalaide was close friends with employee John Sullivan, a young gay man, delighted with the world of grown ups and his very open sexuality. He had traveled to San Francisco and New York and was thrilled with the disco bars and the in your face openness of Castro Street and Greenwich Village. Several adventurous St. Louis businessmen hoping to capture that type of excitement opened a bar (the Bijou) at the very East end of Maryland Avenue at Boyle in a loft warehouse space with a disco booth featuring a big personality DJ named Byron Boone, a young beautiful black drag queen who had worked worked at Helen Schrader's in East St Louis. October 23, 2016: I realized many years ago that I thrived off the many bizarre characters that I crossed paths with in my daily life. None was more outstanding or intriguing than Jimmy Briscoe. I had no idea at the time what a great influence he had over me, or the ideas he seemed to implant in my subconscious so easily - which he was damn good at. His number one rule to accomplish something you want done was to quietly put that idea in someone else's mind just stay in the background and enjoy the hell out of the outcome. I can't count the times I witnessed him accomplish this feat, sometimes hilarious, and sometimes it seemed outright dangerous, but always funny. I remember when my partner and I first opened The Red Bull bar in East St. Louis, Briscoe and his friend Mother Earl Hand became permanent fixtures. Briscoe would tell me if we were to become a success we needed to attract as many characters - and the more unusual the better. On those Sundays when I was not working, he would invite me to go with him to The Club J Lounge, which was also a notorious whore house full of various characters. Then there were the many trips he invited me on to New Orleans, always showing me different ways to make The Red Bull even more successful. What was so unusual was that everything he showed me actually worked beyond my expectations. In a few short years, I knew it was time to open a gay bar in St. Louis. In 1971, I opened The French Market bar and restaurant in Soulard. We designed the place to look like a street in the French Quarter in New Orleans. Every day by 5 pm, Briscoe would be sitting at the bar. He would constantly remind me not to change anything and to leave the place just as it is. The place started attracting the attention of Mayor Cervantes, who was wanting to attract redevelopers and new residents to the Soulard neighborhood. We even hosted one of Mrs. Cervantes’ birthday parties at The French Market. My friend Larry bought a home just a few blocks up from The French Market, and I was now living Soulard too. To my surprise, one evening Briscoe came in the bar and informed me that he and his friend Ted had bought a house on Ninth Street, right around the corner from where I was living. He was sure the area was turning around and that property values would rise tremendously and that maybe in a few years he might open a bar too. I guess I was somewhat skeptical back then, I had no idea that Soulard would rebound the way it did. By 1976 I was tired and moved to Florida. Thirty years later I was looking around on the Internet I found Clementine’s bar photos. I knew at a moment’s notice that Briscoe had to be involved. 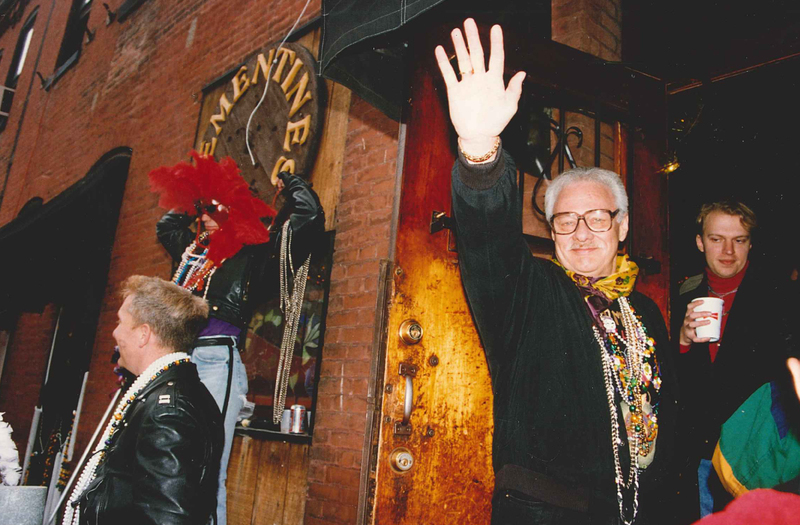 Then, I found videos of Soulard’s Mardi Gras, and again I knew Briscoe had to play a part. Thank you Jimmy Briscoe - you probably helped created the greatest event St. Louis will ever experience. Briscoe died October 7, 2003 at the age of 72.